Boats are continuing to cross the finish line in droves and the town is now buzzing with competitors enjoying a post race drink and live entertainment. All but a handful of back markers are now in the eastern Solent, with the smaller boats looking increasingly as though they will take the main prizes in both the IRC and ISC Rating System divisions. 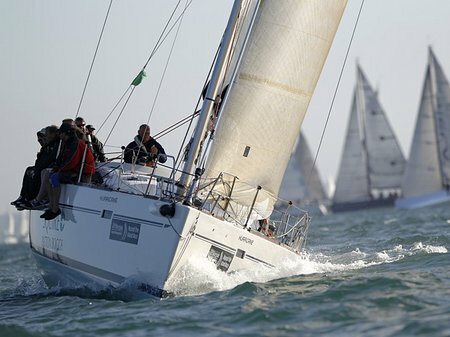 Among the yachts off Fishbourne, a few miles to the west of Ryde, at 1630 was the Ellen MacArthur Cancer Trust’s EMCT2 – Mother T. Having had a problem with the genoa, she is continuing towards the finish at a reduced pace under full mainsail and storm jib. All appear to be in excellent spirits on board. In the Sportsboat class Andrew Blundell reported hitting 18 knots of boatspeed on the south side of the Isle of Wight in a FarEast 28. However, that wasn’t enough to secure victory in this hotly contested class that went to Martin Jones’ J/70 Billy Ruffian, which finished just 36 seconds ahead of another J/70, David McLeman’s Offbeat. In the multihull division, Concise 10, the big MOD70 trimaran skippered by Ned Collier Wakefield, is provisionally overall winner, with John Fisher’s 30ft Coco de Mer second and Nigel Talbot’s Corsair Dash 750 Nitric third. Meanwhile, the tantalising wait for a provisional winner in the IRC classes to be revealed continues while we wait for the slowest boats in IRC Division 3 to finish.